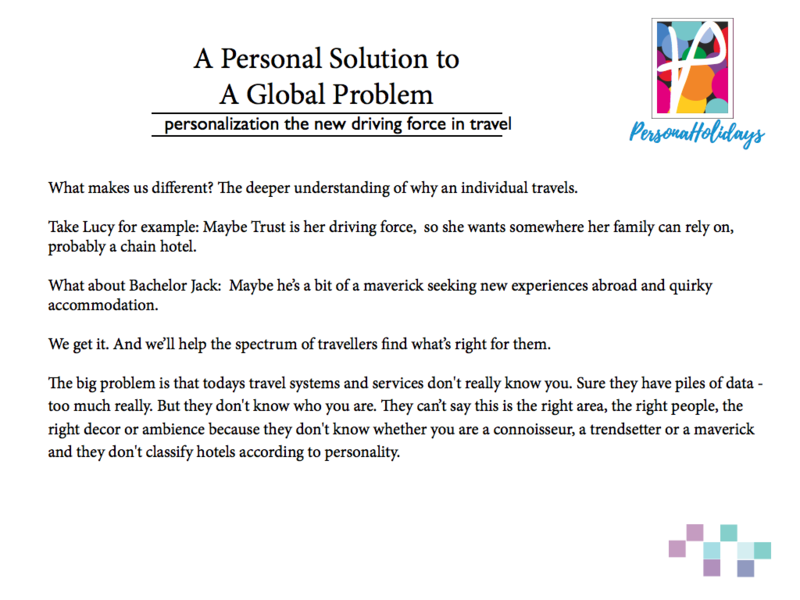 It is a documented fact as we will see in the next slides that personality is increasingly influencing travel decisions. If you are a trendsetter you like to be on the cutting-edge, elite and progressive. You like prestige with a bit of a twist to be different. Nothing in the advertisements, brochures and the travel booking system will tell you precisely this. You just have to look at dozens of sites to glean the information, make inferences and assumptions to make a decision. You have to read between the lines, infer that it is the sort of place with the sort of people you might like spending a holiday with. No booking system will kn ow that you are a trendsetter they just dont think that way. Whats more they dont classify hotels as suitable for trendsetters or as trendsetters themselves. Image then going to PersonaHolidays planner and quickly being seen as who you are and getting a recommendation just for you. Sure you might be ably to look at 100 of place and shop the progressive prestigious trendy places by appearance. But has an expert looked at it and classified it. Not likely. And do you actually know the area. A trendsetter in the getto may not be prestigious at all. But with PersonHoliday the hotel undergoes a rigorous test and is classified by experts. It nice to know that someone who understands you can recommend a place to stay. The hotel test are conducted by Sally Hogshead – a best Selling Author on Personality Archetypes and an award winning Branding celebrity. We will delve into her systems later and see how we use them to help add vital personality attributes to PersonaHolidays hotels and vacation options. Helps travellers find holiday vacation and travel option that suit their personality. Destinations, tourism association, chain hotels, groups of hotels, distributors, and any organisation representing or marketing a diverse set of tourism properties.